Usually I like being taken out of my comfort zone when it comes to review discs. It can get tiresome reviewing the same-old same-old, so when something I’ve never experienced before comes up for review, like it or hate it, I do appreciate the opportunity to see something new. 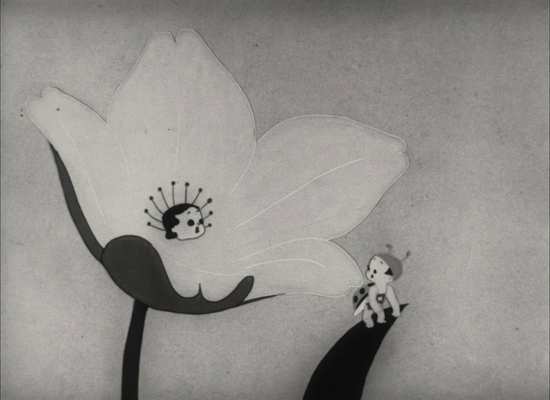 Not this time, even though I am taking a look at a landmark in anime history, the first feature length Japanese animation, less than ten years after Disney did it with Snow White. 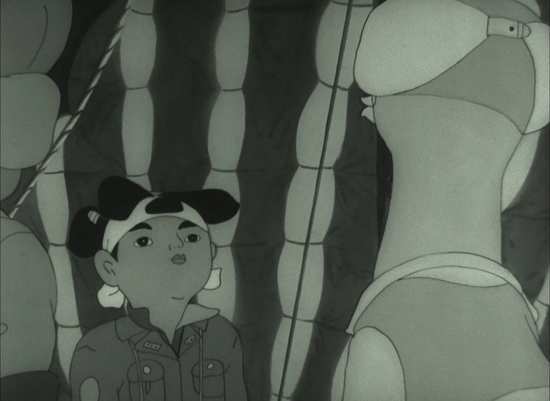 Momotaro, Sacred Sailors is a World War II propaganda film commissioned by the then Japanese Ministry of the Navy. 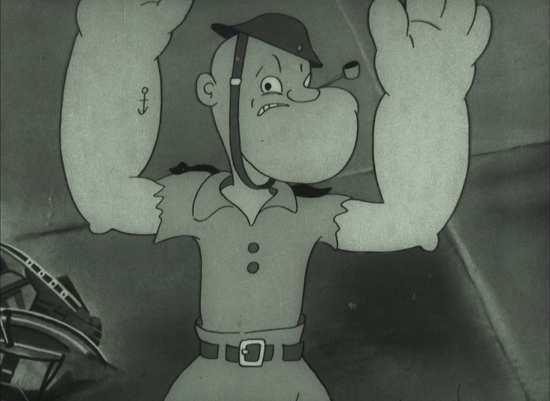 To give myself a little preparation, or perhaps balance, I adjourned to Youtube to catch a little US propaganda from the time, a couple of Looney Tunes cartoons, Bugs Bunny Nips the Nips and Tokio Jokio. Some things quickly became clear. First, entertainment was a tertiary consideration at best. The point of the exercise is to inspire patriotism, and to demonise, if not dehumanise the enemy. Now, you can’t really compare short form animation with feature length animation, but it turns out that Momotaro, Sacred Sailors does hold these goals in common. Thankfully, as well as Momotaro, this release also includes the 1943 short animation, Spider & Tulip, which is a little more conventional a story. 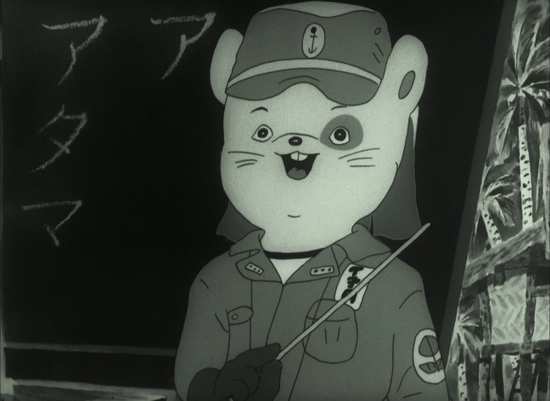 The film follows some anthropomorphic animal sailors in the Japanese Navy, their home life, the essential work that they do, and how they are led by the human Momotaro to liberate islands oppressed by foreign imperialist demons. Both films have been restored for Blu-ray presentation, so the only signs of age you will see will be in the inherent nature of the animation; scratches and print damage are absent. The image for both films is in 4:3 pillarboxed 1080p monochrome format. 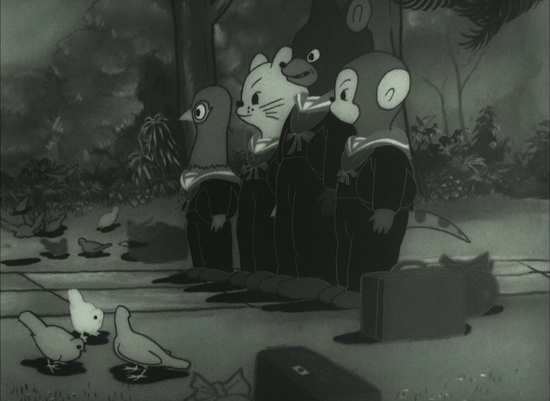 They are both from an era when Japanese animators were looking West for inspiration, so the character designs and animation is Disneyesque, frame rich when it comes to motion, with cute and appealing anthropomorphised animals. 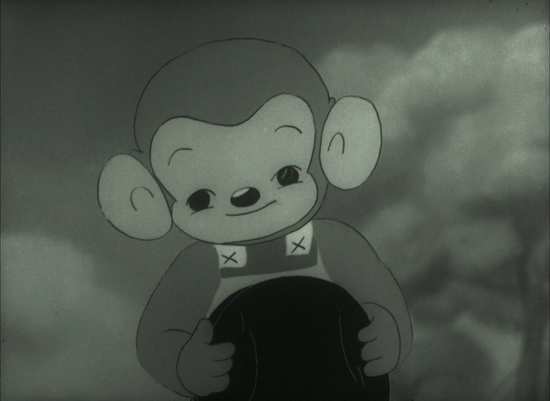 The animation for Momotaro is technically very impressive, using techniques that convey rich depth and dimension to the image. You get DTS-HD MA 2.0 Mono Japanese, with player locked English and French subtitles. The disc defaults to French. The audio is of its age, but is clear and free of glitches and dropouts. The Blu-ray disc boots to an animated menu. 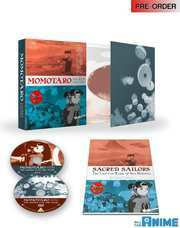 This is a Limited Collector’s Edition release, with the films on Blu-ray and DVD, and with a 128-page book "Sacred Sailors: The Life and Works of Seo Mitsuyo" by Jonathan Clements. I only had the check discs for review. 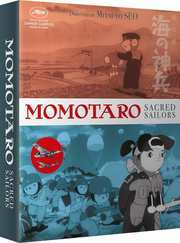 This is half a review, the wrong half really, as Momotaro is certainly not the film you watch for entertainment value. 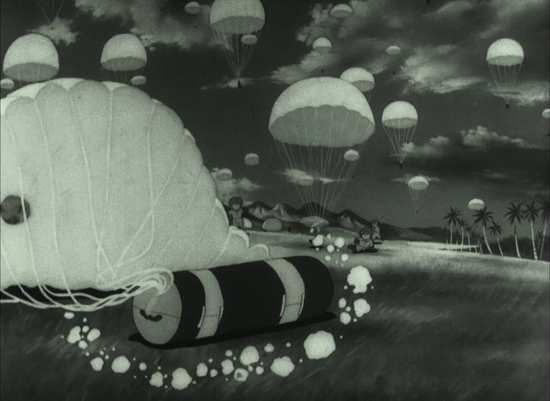 Its worth comes from its place in anime history, the fact that it was the first anime feature, as well as the academic interest that its status as a propaganda piece will engender. This is a film you buy and watch because you want to learn. As such, I feel like I reviewed the wrong bit, that the real value in this collection will be the book from Jonathan Clements. Alas, review copies of that weren’t available. 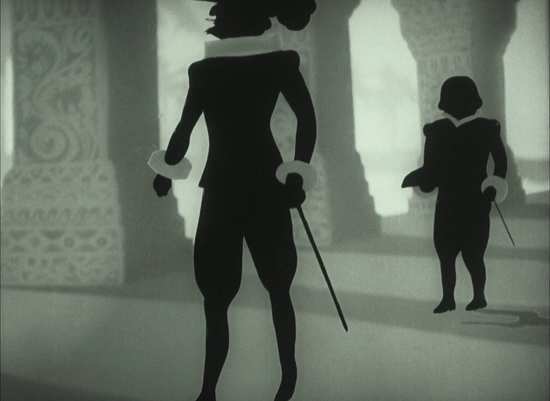 As for the film, as technically impressive as the animation was for its time, you won’t be surprised when I say that I found the film itself really quite dull. It does everything that it’s supposed to for a propaganda film, and given the feature length run time, it has the space to really put its messages across. We begin with the sailors on leave, back home in the sort of pastoral, idyllic country that you would feel honoured to lay down your life to defend. They set robust examples to their younger siblings, to inspire them to grow up and be just like them. Then it’s off to work again, the South Sea Islands beckon, where the Navy is busy building a base, and all the while educating the local savages in proper civilised ways, and where the locals are gleefully happy to work, eternally grateful at being educated. Then Momotaro arrives with a Samurai haircut, and it’s off to war. First a heroic mission to scout Devil’s island, and then the attack, which is interleaved with some exposition explaining the evil, imperialist motives of the foreign devils, referencing the Black Ships, as they insidiously infiltrate peaceful islands and enslave them to their vicious trade practices. 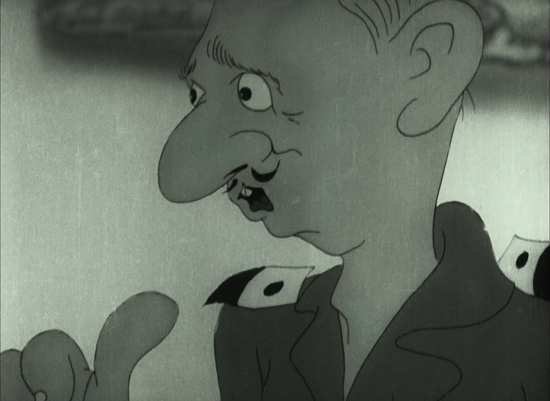 Of course liberating them is easy, as Popeye and Bluto are hopelessly inept, and their leaders are weak-chinned, cowardly and quick to capitulate. 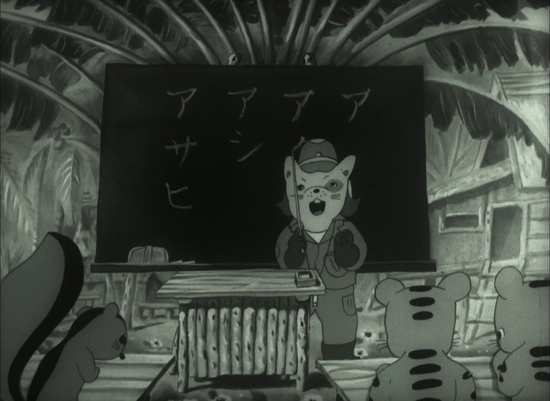 As a propaganda piece, Momotaro is just as unsubtle and obvious as the two Looney Tunes shorts that I mentioned, no doubt because they were preaching to the converted, reinforcing established beliefs rather than trying to change them. If I did notice a difference, it’s that Momotaro invoked ideas of the common good, whereas the opposing side appealed to individuality, but the general thrust was the same. Quite frankly, I was far more interested in Spider & Tulip, which again owes its visual aesthetic to Disney and other similar Western cartoons. There is no obvious propaganda message here; instead it plays like a fable, a cautionary tale. 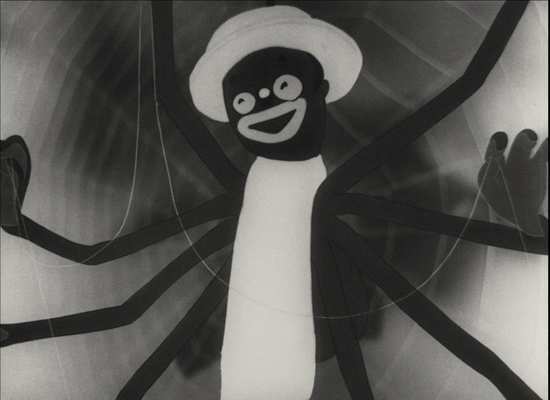 If there is one oddity, it’s that in a film that played to a racially homogenous audience, the villain’s character design was the kind of racial caricature that would have been more common in Western animations. The tale of the ladybird avoiding the predatory attentions of the spider is told well, with the ladybird smart and proper enough to evade his temptations, and when the spider resorts to brute force, the ladybird’s good karma ensures that the weather delivers the spider his just desserts. Although with a modern, jaundiced eye, it’s easy to see the spider as a sexual predator and the ladybird as a naive and innocent child. I wonder if the film played to audiences that way back in 1943. This release will mostly be of academic interest. 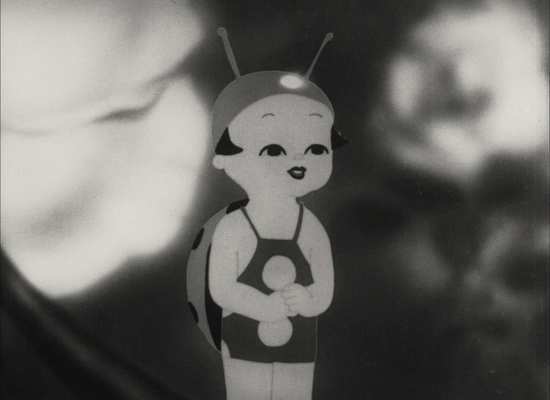 If you have the slightest curiosity in the history of Japanese animation, then this is an essential watch. Because of the subject matter though, the entertainment value in Momotaro is practically non-existent, although the bonus film does make up for that a little. The real value in this release will be in the supplementary material, and unfortunately I can’t comment to that end.